You would think that summertime would give my kids all the outdoor fun they would need. With recent high temps and a horrible infestation of mosquitos in Nebraska, however, my kids haven't been out much.. at all. Thankfully, we have a Wii at our house to get the kids moving and having fun! 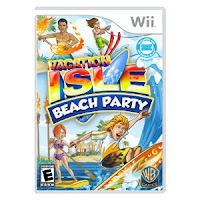 We recently tried a new game called Vacation Isle: Beach Party! It was a blast, and the best part was how much laughing my family did while playing it. Unlike some Wii games, this one actually requires movement (we used our Wii Balance Board frequently.) You can Wakeboard, Hulu Dance, or Fire Dance -- just three of the many activities that up to 4 players can compete against each other in. You can also play alone, if you want to practice up before the competition heats up. I got a kick out of watching my 6-year-old son wiggling his hips during the fire dance activity. My daughter was sitting on her bottom on the Balance Board and trying to steer her way through obstacles on the wakeboard challenge. I really had fun trying to surf! This game requires several components for the Wii that most people already have: balance board, remote, and nunchucks (the board is optional, but needed for the most movement.) If you want to give your kids a really fun way to get the wiggles out indoors, or just pretend that it's summer out -- even when it's not -- this game's for you! I can see us getting it out for some cold days coming up this winter! You can purchase this family game from Warner Brother at Amazon or your favorite game retailer. *Copy received for this review. Opinion is 100% my own.